We’ve all had chicken and rice before, but have you ever tried chicken and kamut? 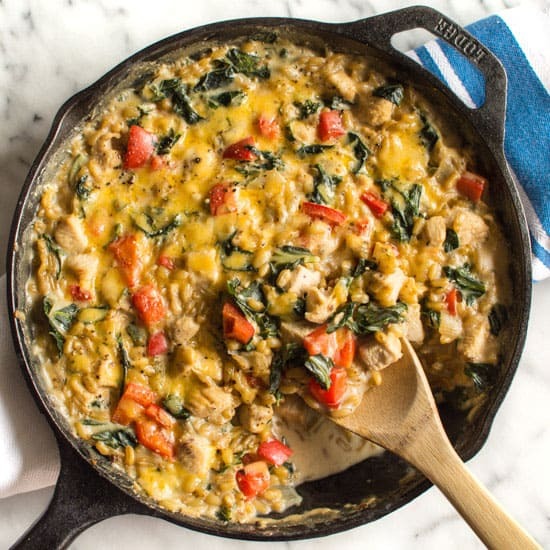 This ancient grain is jam-packed with protein and adds a spectacular chewy texture to this casserole. Kamut. It took me several tries before I figured how to pronounce that one. There was a phase when I pronounced it “come-moo” because kamut makes cows come and “moo,” right? Then I pronounced it “cam[corder]-mutt.” No explanation there. It took a while, but instead of continuing to sound like an idiot, I finally broke down and did what a normal person would: googled it. Pronunciation: kah-moot, accent on the first syllable. Realization: I was so off. 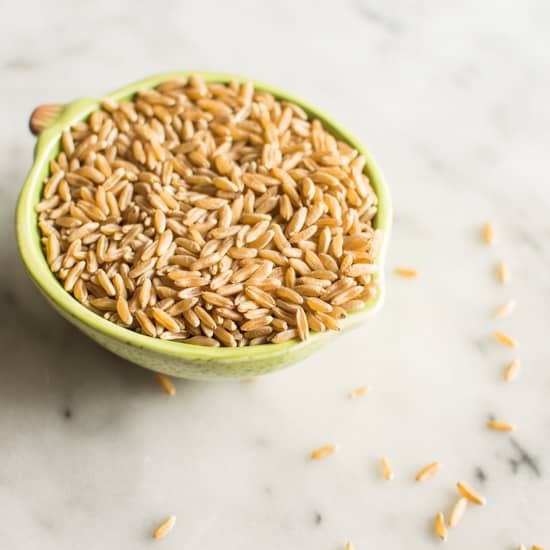 I know we’re head over heals in love with ancient grains now, but have you tried this one? Visually, they’re like long-grain brown rice but much more curvaceous. Texturally, they’re chewy fun. Nutritionally, it’s packed with protein. Three good reasons why kamut should be in our pantries by this weekend. Because kamut is so curvaceous, it needs a bit more time to cook. We’re talking 50 to 60 minutes, about the length of an episode of The Great British Bake Off or Downton Abbey. Yes, I measure time according to my favorite TV shows. So just cook up a huge batch of this over the weekend while watching your favorite show and you’ll have plenty to last you for the rest of the week. I dreamed up this recipe after seeing this Chicken, Broccoli, and Brown Rice delight on Cooking Light. Swapping brown rice for kamut gives this already delicious casserole extra protein. More wholesome goodness for our body! Whisk the milk, flour, salt, and thyme together until there are almost no clumps left. Set aside. 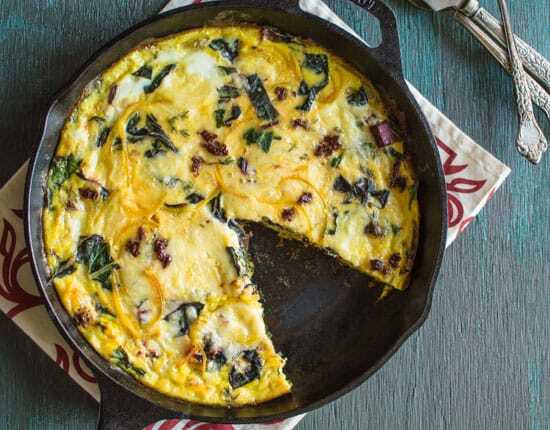 Heat the oil in an iron-cast or oven-proof skillet over medium-high heat. Add the onions and garlic, and stir constantly. Let them cook for about a minute. Add the chicken and cook it for 5-6 minutes. Add the pepper and collard greens and let it cook for a few minutes, until the collard greens have wilted. Stir in the milk mixture in the skillet and reduce the heat a little (about a medium-low). Cook for a minute or two, until the mixture starts to thicken and bubble. Be sure to stir frequently because the sauce will start to burn at the bottom. Turn off the heat and mix in the kamut. Sprinkle cheese on top. Place the skillet in the oven and cook for about 2 minutes, until the cheese has melted. 1. Adapted from Cooking Light.[br][br]2. To cook the kamut, bring a cup of uncooked kamut and 3 cups of water to boil. Reduce the heat to a simmer (with few bubbles bubbling) and cook for 50 to 60 minutes, until the grains are tender. Drain any excess water. I usually double up this recipe to make a huge batch at a time. I haven’t used kamut but I am very intrigued now! I am pinning this to try! oh I love learning about new grains!!! I’ve never heard of or had kamut before!!! This looks sooo good, Lisa!!! You have to try it, Alice! It’s like a larger and slightly chewier version of wheat berries! This looks beautiful, Lisa! So rich and comforting. I have actually never tried kamut before. Thanks, Kelly!! Kamut is definitely worth trying! 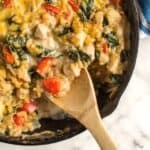 kamut is a grain that I have yet to try, but this casserole looks fantastic! This looks so good! Kamut has been on my list of grains to try for a while now, so I hope to make this soon! Yes! Let me know if you try the kamut, Amber! I need to try kamut! This looks so good! Yay! Let me know how it goes, Janice! I love meals like this! Added this to my dinner menu for next week and can’t wait to make it! What a beautiful dish! Time for me to try out Kamut! Your photography is wonderful and that recipe looks amazing. Can you believe I have zero experience with kamut? I’ve heard such marvelous things about it, so I really have no excuse! 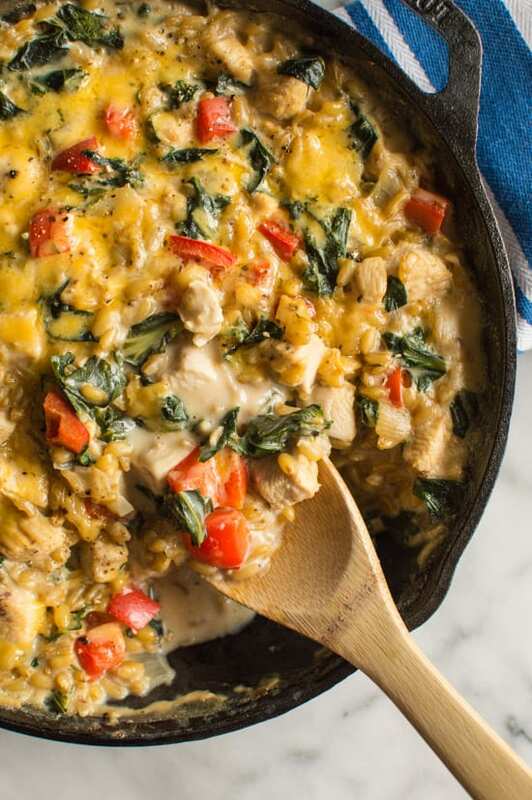 My mouth is watering so hard over this creamy chicken skillet, and it’s only 7am, ha! I must make this for dinner over the weekend – #SkilletFood for the win! I ate some of this for breakfast one day, so I feel your craves! You should definitely try kamut! Takes forever to cook, but totally worth it! This sounds like such a tasty spin on a classic! You have to love the total comfort-food vibe. Lisa- This looks wonderful! We shared this on our Facebook page and thought to pop over with some more information about KAMUT® Brand khorasan wheat for you and your readers. Uhhh…oops. Guess I’ve been pronouncing it wrong all this time too! What the heck!…No one has ever said anything. Lol But on a serious note, this is going on our menu next week. Thanks for the recipe Lisa! Haha, glad I’m not the only one! Let me know if you give this a whirl! I threw this in the old calorie counter, and it said 368 calories, 29 g protein and 34 g carbs per serving. My daughter had a jar of karmut in her pantry for years, so to get rid of it I looked up recipes and found yours. Using what was available, I substituted spinach for the collard greens, vanilla almond milk and heavy cream instead of milk, a few.different herbs, and shredded cheddar cheese. No iron skillet, so I topped a regular skillet to melt the cheese. Turned out super yummy. Recommend cooking the karmut in advance and cooking it well, difficult to overcook, and important to be plump and tender. Hi, Kenneth. Thanks for trying the recipe! Glad you and the family enjoyed it!